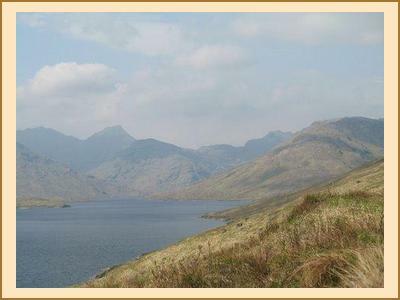 Despite the fact that we are a walking club when given the option of a pleasant 3 hour stroll along Loch Hourn on the Friday evening or a 15 minute boat trip up the loch every single person on the meet opted for the boat, worried about losing drinking time perhaps. After the boat dropped us off there was a 1.5mile walk up to the Whitehouse, a bit longer than I had advised people but I never could judge distances on a map. The weather on Saturday remained as it had been, warm and clear. We awoke to find Martin had already set off on one of his classic Martin rounds, ie every hill within a 10 mile radius, which in this instance took in Sgurr a Choire Bheithe, Ben Aden, Sgurr na Ciche, Garbh Chioch Mor and Sgurr nan Coireachan so just a short day. I met Martin on top of Ben Aden and was for a minute nearly persuaded to join him but managed to have a quiet word with myself just in time and I carried on to Sgurr a Choire Bheithe, which Kenny and Alison were also on having walked in on the Saturday morning from Loch Quoich. Fiona took in Luinne Bheinn and Meall Buidhe, Gillian also did Ben Aden while most of the remaining party made an assault on Ladhar Bheinn and the neighbouring Corbett, when I say neighbouring I mean its about 6km away, be rude to leave it out really. Back at the bunkhouse being a typical man I failed to read the instructions regarding how to get hot water out the shower and complained bitterly about how cold it had been, while everybody else raved about how hot their shower had been, having sensibly actually read the instructions. During all this Martin was getting rather hot under the trousers as it was looking like he might have to shower with his new slacks still on, the belt buckle having become trapped fast in the trouser lining, surgery was required to free the poor man from his predicament. The buckle was removed and the offending article placed on the table from where it vanished into thin air, never to be seen again, would the trousers stay up without it? Thankfully for all concerned they did, honestly you couldn't make it up. After all this everybody retired to the Ron prepared fire in the lounge and scoffed beer, wine and snacks. The next day was wet, windy and very windy, did I mention it was windy. People took off in various directions, I repeated the Corbett, Ladhar Bheinn combination, Kenny and Martin took in Ladhar Bheinn as well, a real struggle coming off the North ridge in the wind. Alison W, Ron & Ewan did Meall Buidhe but got literally blown off course trying to reach Luinne Bheinn so made an early descent. Sgurr a Choire bheithe was taken in by Fiona, Anne and Gillian while Alison made for the Graham, Slat Bheinn. A less eventful evening followed, I managed to have a hot shower, Martin got out of his trousers and the remaining wine and beer was consumed. Next morning myself, Ron, Ewan, Fiona and Alison W took the boat option out while the rest made their way back to Kinloch Hourn by way of the Graham of Meall nan Eun.